The i-Cybie has some of the most impressive and flexible body movements I have seen in a low cost consumer robot. His legs are multi-jointed and invertible and he can do everything from handstands, push-ups, and more. The Robopet has very simple legs without any joints, but he makes very good use of his waist and shoulder joints. He can be trained to respond to your voice to obey a handful of spoken commands. The Robopet requires a PC running special software like Robosapien Dance Machine to support voice control (not included with the stock unit). He will respond to morse code like clap commands too. For example, 2 hand claps will make the i-Cybie sit down. The Robopet does not have this feature. If you purchase the (currently) expensive walk-up charging station which is not included with the stock robot, he will automatically recharge himself when his batteries are running low just like a Roomba robot vacuum cleaner does. (Here's a link to some consumer reports on Roomba the robot vaccum cleaner.) The Robopet doesn't have this option. The eyes on the i-Cybie change colors and blink at varying rates to let you know the internal state of the robot dog and to help you with various operations like training the voice commands, etc. The Robopet doesn't have any real eyes. The Robopet is just plain funny. He's a fast moving dog. For example, he can flip himself over and play dead in the blink of an eye (Watch out for this if he's on a table!). He's rebellious, and likes to try out different tricks all by himself and at weird times. The slower bigger i-Cybie has some of these traits, but the Robopet has the edge in this department. He will run for hours and hours on a fresh set of batteries. In contrast, after 3 to 4 hours of solid play the i-Cybie will need recharging and intensive use of even 1 to 2 hours can drain the batteries. While the i-Cybie is the clear winner for amazing body movements, he is a bit slow and plodding. The Robopet is whip fast which makes him feel a little perkier. The R2D2 like sounds on the Robopet are just plain funny. They feel like they were done by a Hollywood sound company as opposed to the i-Cybie's quality but somewhat boring sound effects. Which one should you choose? If you have the money, get both. They are completely different robots and clearly different robot dogs. If you are on a budget, then the Robopet will be close to half the cost of the i-Cybie. Otherwise, read the features above again and see which feature speaks to your heart the most. One quick note, the i-Cybie is about four times the size of the Robopet. I'll be putting out some comparison videos of the two dogs soon, so you can really see what I am talking about in this post. If you want to be notified when they are finished, then use the subscribe form at the top of my blog. Here's a cool idea for something to do with your Robopet when traveling. When I stay at a hotel or motel, I always wonder whether or not someone has come into my room or not, when I step out for a moment. Here's how to find out. Put your Robopet near the door and set him to Guard mode. When you come back, take him out of Guard mode. If he simply stands up when you do that, then your room was not disturbed. If he responds with a sequence of growls and pants, then someone entered the room while you were gone. Of course if someone takes your Robopet, then you'll also know that your room was disturbed but it is more likely that his barking and growling might just chase off a would-be burglar. Be prepared to explain to the hotel that you don't really have a dog in your room! Robopet Controlled By Lego Mindstorms RCX computer! There's a new heavyweight hacker in town and his name is Pavel Petrovič. Him and his friend Richard Balogh are doing amazing things with infrared signals, especially in regards to controlling other robots with the Lego Mindstorms RCX computer (also known as the RCX brick). He recently created code, that he is sharing publicly, that controls a Robopet robot from his Lego Mindstorms Roverbot. The little Roverbot wheels around and issues infrared commands to the Robopet, and the Robopet obediently carries them out. Make sure you watch the fascinating video of this interspecies robot communication experiment. This is not confirmed yet, but I just had a forum user post a message saying that he saw the Mini Robopet at a local K-mart in Australia. The strangest part of the post was that the Mini Robopet appears to be a wind-up toy! The cost for the Mini Robopet at that K-mart was a little under $10 AUD. If anyone has a Mini Robopet or has played with one at a local store, please post a comment with details about it. Also, tell us how many features it has compared to the full-sized Robopet. Robopet - Guardian Of The Egg Sandwich! True and hilarious Robopet story. I found out about this wonderful picture from Lem Fugitt's Robot Dreams blog (if you're not reading it regularly you really should). Apparently at her Christmas party Megan had an egg sandwich that the family dog wanted to chow down on really badly. 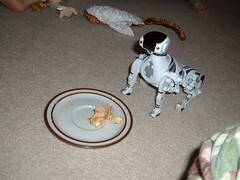 Megan put the Robopet in guard mode near the sandwich. Every time the dog approached Robopet barked and scared the dog away! A truly creative use of Robopet! Go and see the rest of Mavra's Robopet photo's on flickr! Lem Fugitt has done it again with a really great video of the Robopet's walking gaits. If you have been wondering how well the Robopet gets around then this is the video for you. Being the technical guy that he is, he actually explains how the Robopet manages to walk. He points out that the Robopet takes advantage it's rocking motion to move; a trait common to all of Mark Tilden's current robots. He also gives an interesting breakdown of how the Robopet manages to turn using different movements for its front and back legs; with all of this being done without any knees! Take a look at his blog page and then watch the video, "My Puppy Has No Knees! ".